AB 10 increases the California state minimum wage from $9 per hour to $10 per hour effective January 1, 2016. California employers are required to pay the new minimum wage to non-exempt employees, and possibly more if their employees work in cities where local ordinances require a higher minimum wage (e.g., San Francisco, Oakland, Emeryville, and San Diego). Some employers are not only raising their entry level wages, but looking at the ripple effect (what we call “wage compression” in the compensation world) for other non-exempt employees currently paid at or near the new minimum wage. The law does not require that everyone steps up in hourly pay rates because the lowest rate is increased. However, the costly impact of this internal equity issue is worthy of consideration. 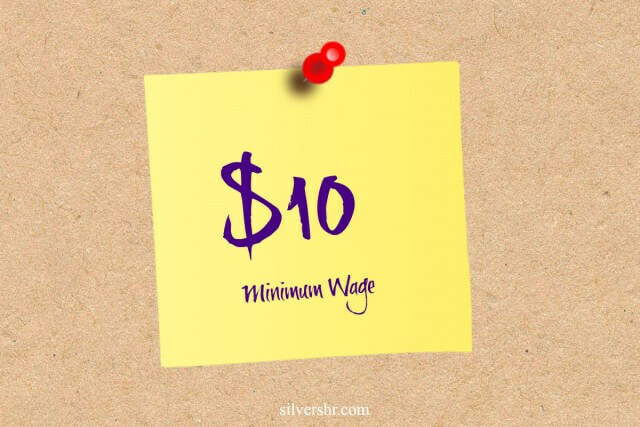 California employers will need to post the Minimum Wage poster (included in the all-in-one state and federal posters that may be ordered through Silvers HR) along with their Industrial Wage Order. However, this minimum wage change has several other impacts to California (exempt and non-exempt) employees that many employers have not considered, even if they do not have minimum wage employees. Exempt classifications: This increase will not only affect your non-exempt employees who are paid below the new minimum wage, but will also result in an increase to the minimum salary for exempt level employees in order to meet the salary test for state wage and hour exemptions. Unlike federal law, the salary test for most CA exempt classifications is a monthly salary equivalent of no less than two times the state minimum wage for full-time employment. For example, the new exempt minimum salary for the executive exemption will move from $3120.00 per month to $3466.67 per month ($41,600.00 per year) on January 1, 2016. The minimum salary threshold does not include bonuses or commissions. We recommend you review your payroll records for your exempt employees to ensure you are meeting this new monthly minimum. Commission payments: If you have a non-exempt commissioned employee who receives a “draw” or advance against commission earnings then the employee needs to receive at least minimum wage for all time worked, including overtime for this advance payment. Of course, now this will need to be based on the new minimum wage. Piece rate: Keep in mind that piece rate workers must be compensated for all time worked (and rest breaks) based on the Downtown LA Motors case and the newly signed AB 1513. An average of hours worked and total compensation will not fly in California based on this important case and law. If the employee furnishes his/her own work tools then this is two times the state minimum wage. According to AB 1513 piece rate employees must be paid a regular hourly rate for all hours worked that is no less than the higher of: an average hourly rate determined by dividing the total compensation for the workweek, exclusive of compensation for rest and recovery periods and any premium compensation for overtime, by the total hours worked during the workweek, exclusive of rest and recovery periods; or the applicable minimum wage. Meals and lodging rates: Also changing are the meal and lodging rates California employers may apply to calculating compensation for non-exempt employees. These rates are noted on the CA minimum wage poster. Employers who offer these benefits will want to review their compensation plans to ensure they are appropriately adjusted. Other minimum wages in CA: There are local minimum wages higher than $10 per hour within our great state. For example, San Francisco is now $12.25 per hour (moving to $13.00 per hour on July 1, 2016), San Jose will be $10.30 per hour on January 1, 2016, Oakland will be 12.55 per hour on January 1, 2016, San Diego will be $10.50 per hour on January 1, 2016, and Emeryville will be $12.25 or $14.44 per hour depending on the business’ size. The exempt salary test noted above is based on two times the state minimum wage and not the local minimum wage – whew! External Equity? While you’re looking at salaries for the positions affected by these minimum wage changes above, you may want to look at the market rates (“external equity” in the compensation world) for some of your key positions to ensure you’re paying base salary and incentives competitively. The California Fair Pay Act (SB 358) is landmark legislation requiring internal and external pay equity based on gender. The Bureau of Labor Statistics offers free salary information for some positions at their site. Although the data matches may not be immediately current or a complete match, this information may be helpful for very common jobs that are similar across many industries. Silvers HR has also purchased a large national salary survey with thousands of positions. The survey data can be sliced to the employer’s local market. There is a fee for this survey data. Call us if you’d like to learn more.